All you need to know about the 1st total solar eclipse visible from the contiguous U.S. since 1979, from eclipse master Fred Espenak. Path of 2017 total solar eclipse, via Fred Espenak. On August 21, 2017 a total eclipse of the sun will be visible from within a narrow corridor that traverses the United States. The path of the moon’s umbral shadow begins in the northern Pacific and crosses the U.S. from west to east through parts of the following states: Oregon, Idaho, Montana, Wyoming, Nebraska, Kansas, Missouri, Illinois, Kentucky, Tennessee, North Carolina, Georgia, and South Carolina. The moon’s penumbral shadow produces a partial eclipse visible from a much larger region covering most of North America. 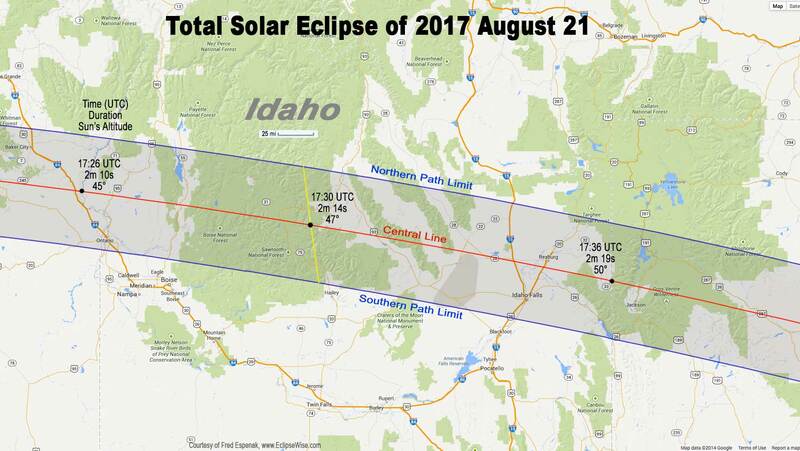 This special web page – a reprint of a similar page at eclipsewise.com by Fred Espenak – contains preliminary information about the 2017 total eclipse of the sun. 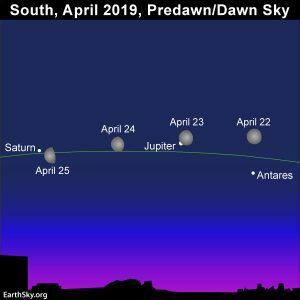 It will be updated with more information as eclipse day approaches. The EclipseWise Prime Page for the August 21, 2017 eclipse presents detailed information on this event including the primary eclipse characteristics, conjunction times, geocentric coordinates of the sun and moon, lunar libration values, penumbral and umbral shadow contact data, central line data, polynomial Besselian elements and additional links. 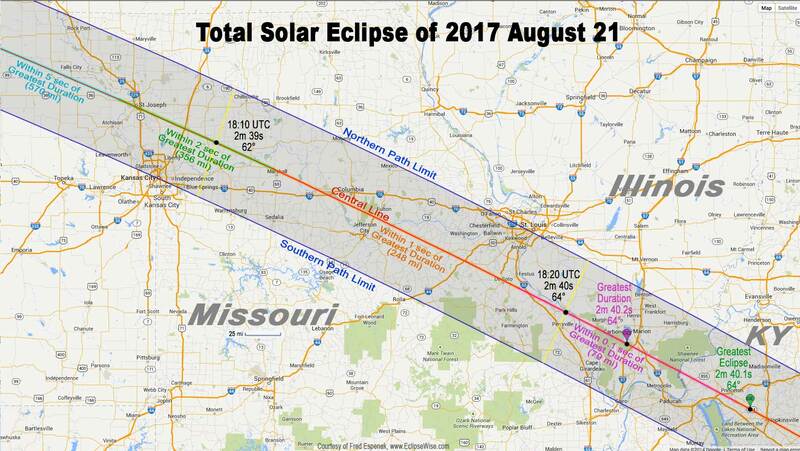 Orthographic map of August 21, 2017 total solar eclipse, via Fred Espenak. 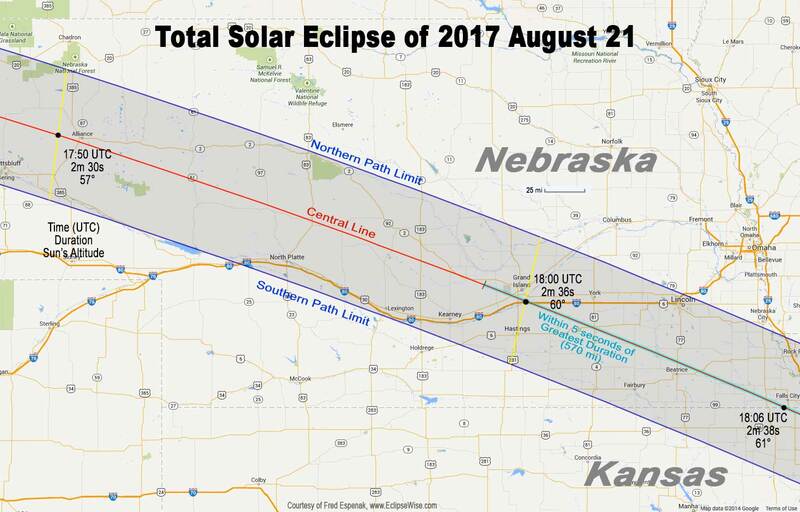 Click here for an interactive map by Fred Espenak of the August 21, 2017 total solar eclipse. Click here for an interactive map by Xavier Jubier. Click here for an interactive map by Bill Kramer. View larger. 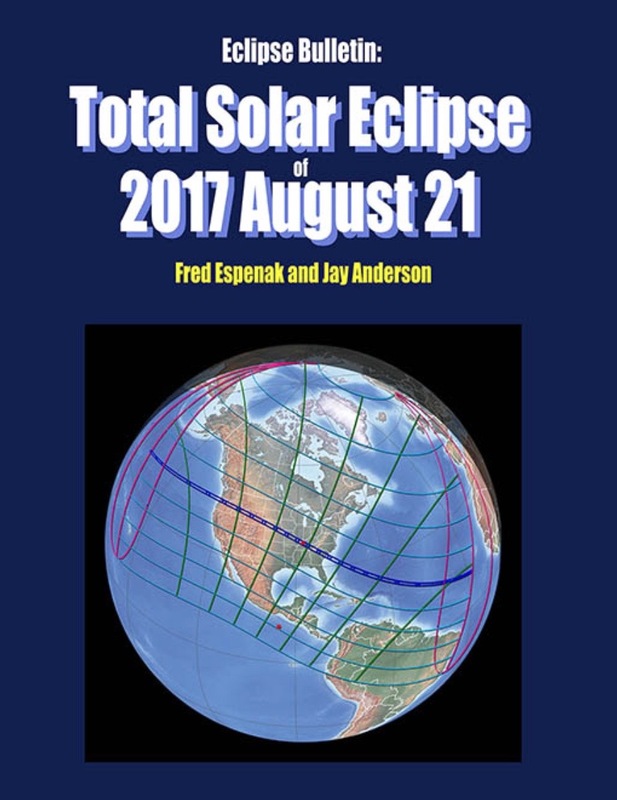 | Greatest duration/ greatest eclipse for August 21, 2017 total solar eclipse, via Fred Espenak. The following maps show the path of the 2017 total solar eclipse in intermediate detail for locations across the United States. The path of totality is shaded for clarity, and lines of maximum eclipse have been plotted (in yellow) at 10-minute intervals. The Coordinated Universal Time (UTC), the duration of totality (minutes:seconds) and the Sun’s altitude (degrees) is given on the eclipse central line at 10-minute intervals. The maps also include cities, major towns, highways, rivers, lakes and parks. 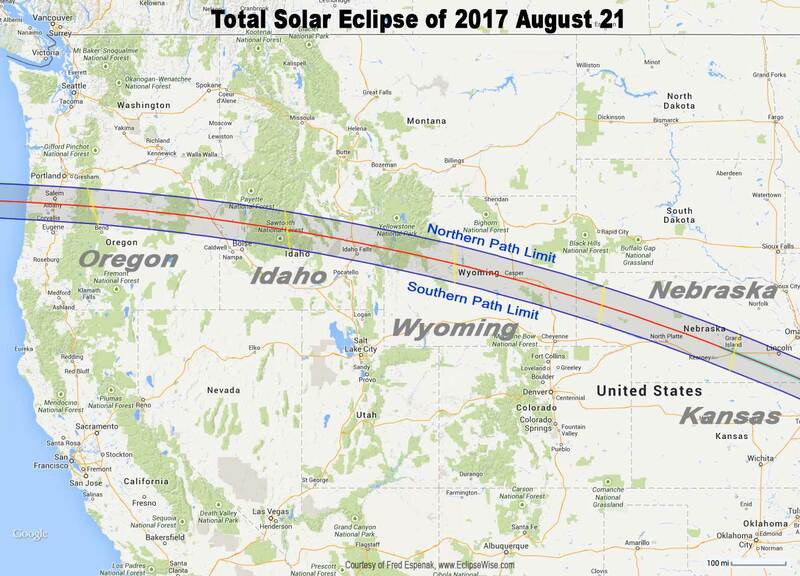 Total Solar Eclipse Path through Western U.S.
Total Solar Eclipse Path through Eastern U.S. 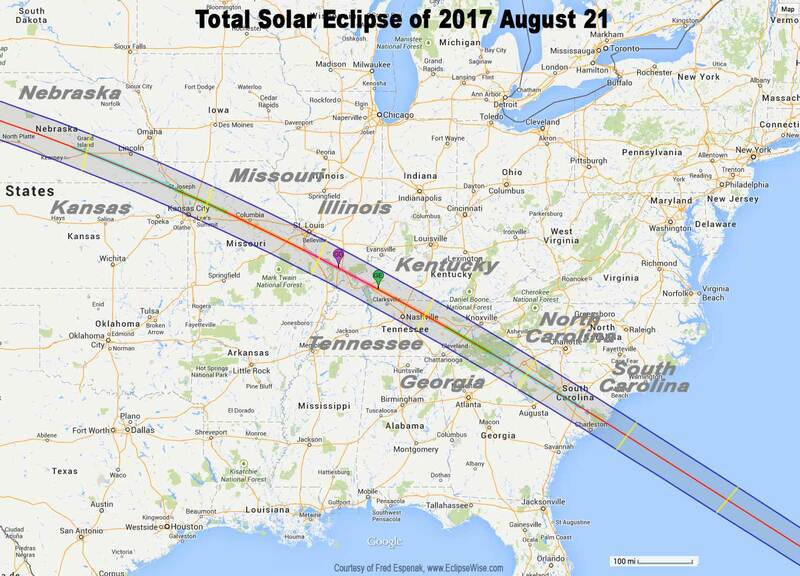 The following maps show the path of the 2017 total solar eclipse in maximum detail for the United States and by state. Within the path of totality, curves of constant duration have been plotted for the total phase. Note that the constant duration curves are calculated using the exact shape of the Moon. Mountains and valleys can shorten or lengthen the duration of totality by 1-3 seconds. The maps also include the general terrain highlighting major towns, cities, and highways. These maximum detail maps were prepared by Michael Zeiler (Esri) using a high level CAD/GIS (Computer Aided Drawing / Graphic Information System) with data provided by Fred Espenak (NASA/GSFC) and Xavier Jubier. These poster-size maps can be saved to your computer for printing. You will have to scale the print size in your printer dialog to fit them to the page size you are printing. View larger. 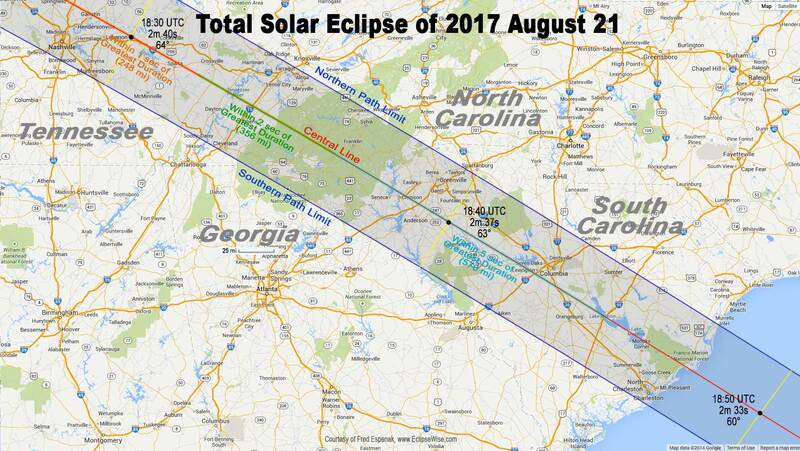 | Some things to think about in choosing a place to view the August 21, 2017 total solar eclipse. The go-to guide for the August 21, 2017 total solar eclipse. Order here. 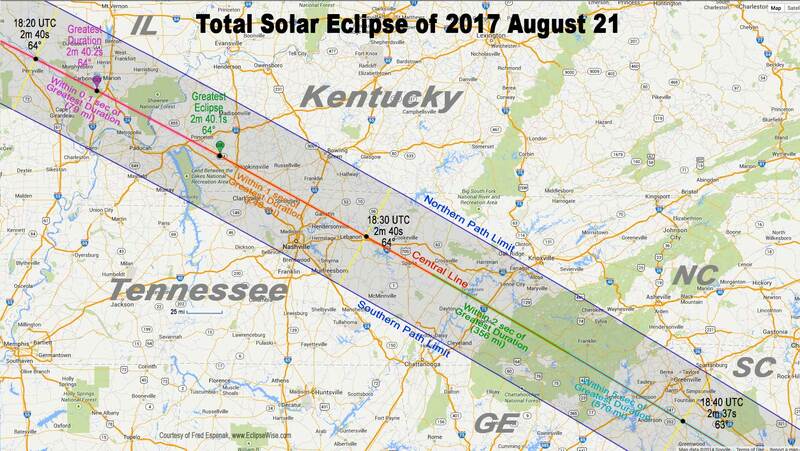 Eclipse Bulletin: Total Solar Eclipse of 2017 August 21 is the ultimate guide to this highly anticipated event. Written by two of the leading experts on eclipses, Fred Espenak and Jay Anderson, the bulletin is a treasure trove of facts on every conceivable aspect of the eclipse. The exact details about the path of the Moon’s shadow can be found in a series of tables containing geographic coordinates, times, altitudes, and physical dimensions. A set of high resolution maps plot the total eclipse path across the USA. They show hundreds of cities and towns in the path, the location of major roads and highways, and the duration of totality with distance from the central line. 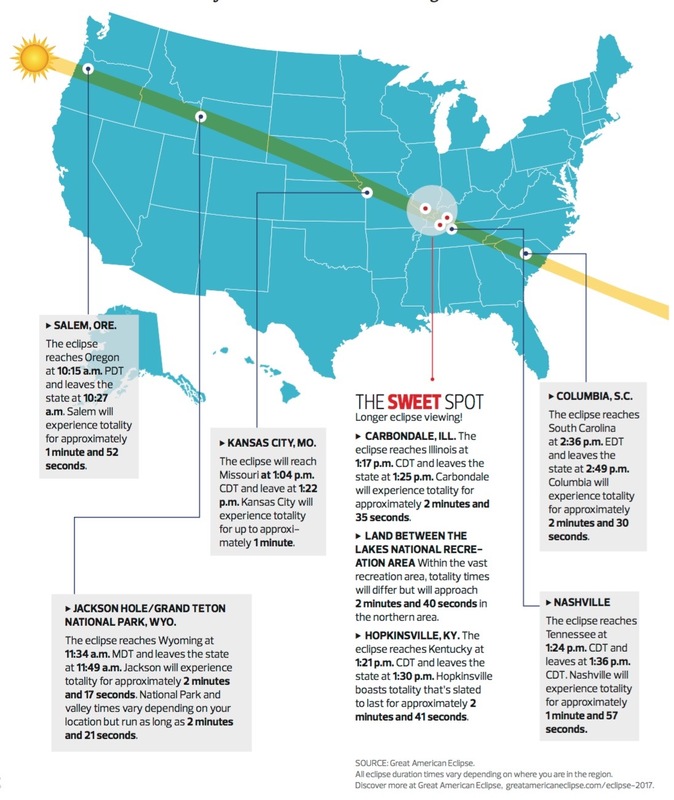 Local circumstances tables for more than 1000 cities across the USA provide times of each phase of the eclipse along with the eclipse magnitude, duration and Sun’s altitude. 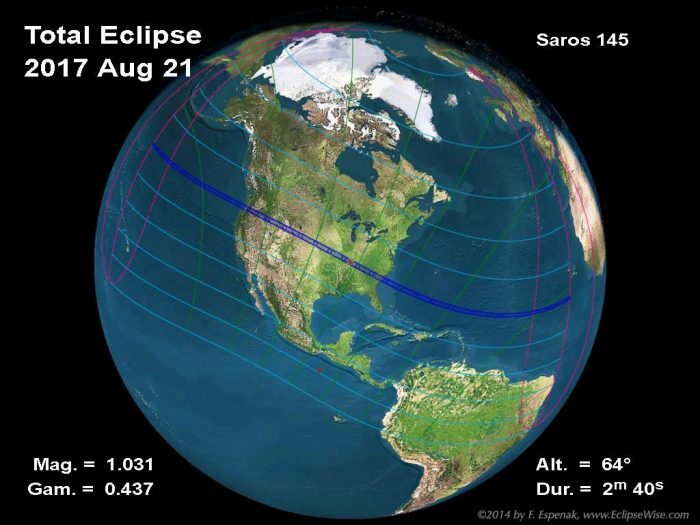 Additional tables cover the eclipse circumstances for cities in Canada, Mexico, Central and South America and Europe. An exhaustive climatological study identifies areas along the eclipse path where the highest probability of favorable weather may be found. 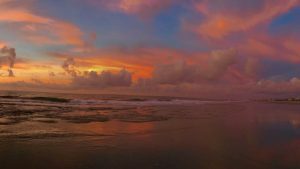 A travelogue highlights key locations in the eclipse track from Oregon through South Carolina. Finally, comprehensive information is presented about solar filters and how to safely observe and photograph the eclipse. 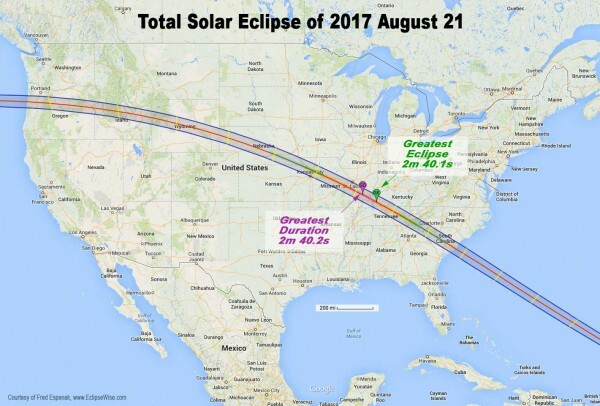 The Portal To The Universe Blog discusses the 2017 Eclipse Bulletin in more detail. Road atlas for August 21, 2017 total solar eclipse. Order here. The Road Atlas for the Total Solar Eclipse of 2017 contains a comprehensive series of 37 high resolution maps of the path of totality across the USA. The large scale (1:74,000 or 1 inch = 11 miles) shows both major and minor roads, towns and cities, rivers, lakes, parks, national forests, wilderness areas and mountain ranges. Armed with this atlas and the latest weather forecasts, the road warrior is ready to chase totality no matter where it takes him/her along the 2500-mile-long path. This mobile strategy offers the highest probability of witnessing the spectacular 2017 total eclipse in clear skies. The 48-page book measures 8.5 x 11 inches. Available in Black & White and Color Editions. 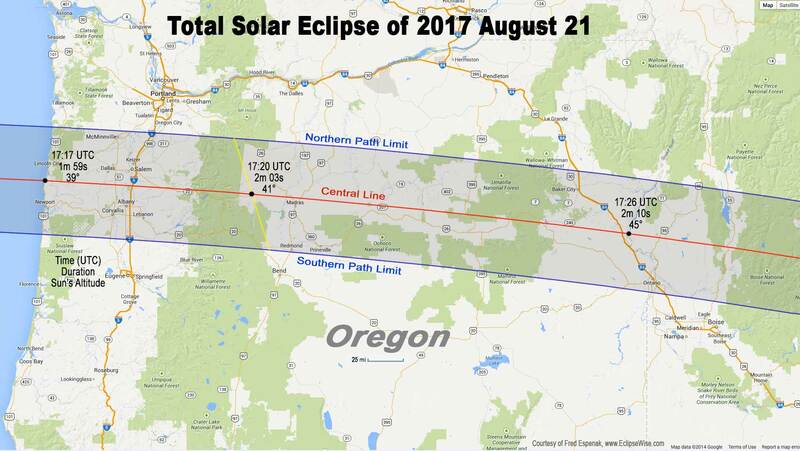 For more information visit Road Atlas for the Total Solar Eclipse of 2017. Have kids? You might want to order this book. “TOTAL Eclipse or Bust! A Family Road Trip” is a book for the entire family. 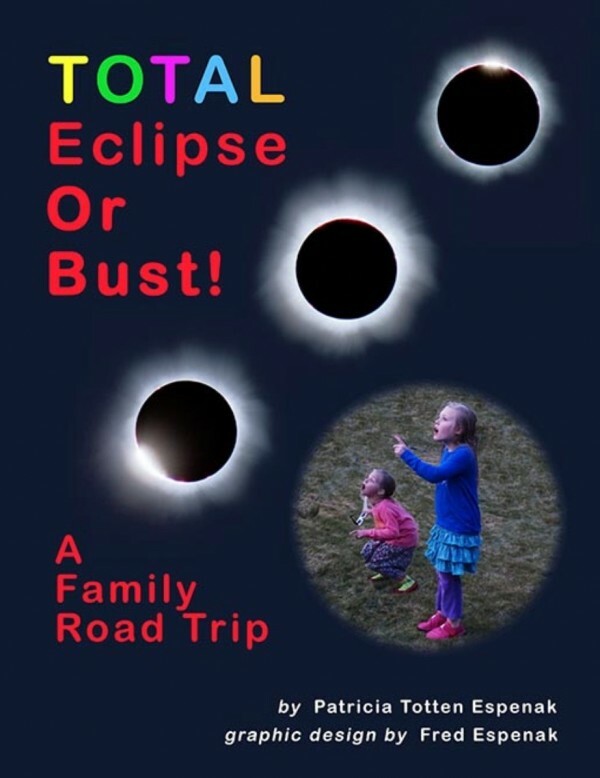 The story follows a typical family on a road trip to see the 2017 total eclipse of the Sun. Along the way the children learn all about the how and why of eclipses in a friendly and an uncomplicated way. 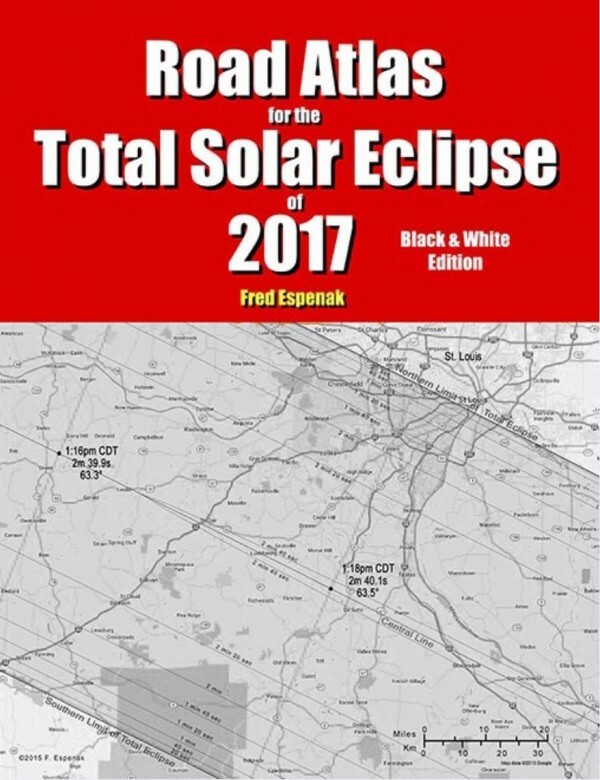 The book also provides basic information about how to view a total solar eclipse and where to go for America’s great eclipse on August 21, 2017. Finally, comprehensive information is presented about solar filters and how to safely observe and photograph the eclipse. This full color 38-page book measures 8.5 x 11 inches. For more information visit Total Eclipse or Bust! A Family Road Trip. The total solar eclipse of March 29, 2006 as seen from Jalu, Libya. Photo by Fred Espenak. View eclipse photo gallery. 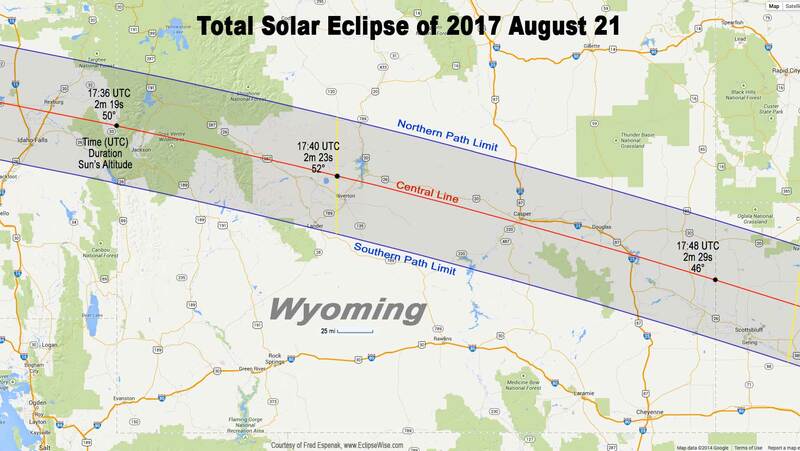 Bottom line: Links to everything you need to know about the total solar eclipse of August 21, 2017. It’ll be the first total solar eclipse visible from the U.S. since 1991 (seen only from part of Hawaii), and first visible from contiguous U.S. since 1979. Start planning now! Fred Espenak is a scientist emeritus at Goddard Space Flight Center. For decades, he has been NASA's expert on eclipses, and some of you may know him as Mr. Eclipse. Fred maintains NASA's official eclipse web site (eclipse.gsfc.nasa.gov) as well as his personal web site on eclipse photography (mreclipse.com). Now retired and living in rural Arizona, Fred spends most clear nights losing sleep and photographing the stars (astropixels.com). His latest website is devoted to helping you enjoy eclipses (www.eclipsewise.com). He is an EarthSky content partner.